After posting so many complicated cases, I thought it may be time to review my standard procedure with this one-eyed patient showing some slight macular degenerative changes. Leaving this patient myopic for better reading vision quality, my chopping technique, settings, and the benefits of vacuuming the posterior capsule are all discussed. 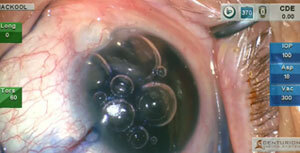 Endothelial protection is always important, though in a patient with severe corneal dystrophy and a shallow anterior chamber, it is even more critical. In this case, I discuss several pearls for safe removal of the nucleus in a patient with a severely compromised endothelium. We start our 4th season with a very interesting case! My preoperative plan was to use a toric IOL in this 89 year old patient with a very dense cataract. 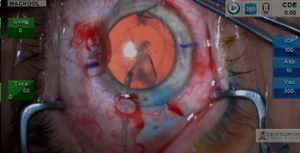 After discovering a complete lack of zonular support, I perform a vitrectomy and change my lens choice to an AC IOL. 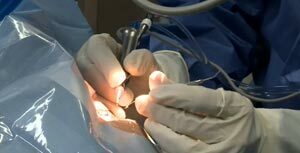 I discuss control of the remaining astigmatism near the end of the procedure. the preoperative OCT image. 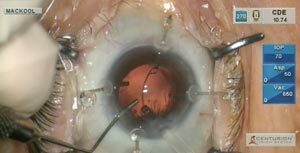 During the procedure I discuss its formidable challenges and explain the methods necessary to remove the extremely rigid lens. Episode 35: Dense nucleus, lax zonule and capsular tension ring insertion. 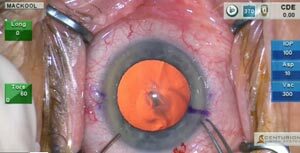 Continuing with complicated cases, this month I demonstrate removal of a dense cataract in an eye with zonular laxity and a possible preexisting posterior capsule defect. 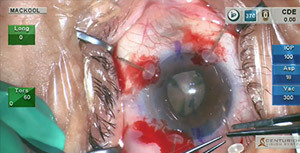 Techniques employed include hydrodelineation, insertion of capsule retractors, and insertion of a capsular tension ring. We change it up a bit this month by showing 2 implantations of a stent into the trabecular meshwork in eyes with glaucoma. The first case shows a straightforward insertion, and the second demonstrates successful insertion after failure of the initial attempt. 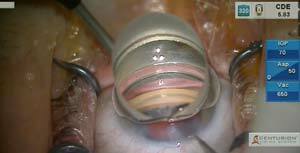 The cataract and IOL insertion of each case were routine, so we present only the MIGS portion of each case. For our viewers who have requested complexity, this one certainly fits the bill: a highly myopic eye with previous retinal detachment, scleral buckle and partial pars plana vitrectomy, residual anterior vitreous opacification, shallow anterior chamber, convex anterior capsule, extreme zonular weakness, infusion misdirection syndrome and 3 diopters of astigmatism requiring toric IOL implantation. Whew! This is a routine case during which I discuss anticipation and prevention of problems caused by patient coughing, infusion misdirection syndrome, and finally the intracameral antibiotic controversy.